The instant New York Times bestseller featured on NPR's Weekend Edition with Scott Simon! B. J. Novak (bestselling author of The Book With No Pictures) described this groundbreaking poetry collection as "Smart and sweet, wild and wicked, brilliantly funny--it's everything a book for kids should be." 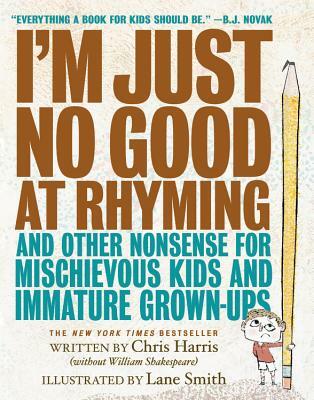 Lauded by critics as a worthy heir to such greats as Silverstein, Seuss, Nash and Lear, Harris's hilarious debut molds wit and wordplay, nonsense and oxymoron, and visual and verbal sleight-of-hand in masterful ways that make you look at the world in a whole new wonderfully upside-down way. With enthusiastic endorsements from bestselling luminaries such as Lemony Snicket, Judith Viorst, Andrea Beaty, and many others, this entirely unique collection offers a surprise around every corner. Adding to the fun: Lane Smith, bestselling creator of beloved hits like It's a Book and The Stinky Cheese Man and Other Fairly Stupid Tales, has spectacularly illustrated this extraordinary collection with nearly one hundred pieces of appropriately absurd art. It's a mischievous match made in heaven! Chris Harris was a writer and executive producer for shows such as How I Met Your Mother and a writer for The Late Show with David Letterman. His pieces have appeared in The New Yorker, Esquire, ESPN, The New York Times, The Wall Street Journal, and on NPR. He was also the author of the anti-travel guide Don't Go Europe! He lives in Los Angeles. Lane Smith wrote and illustrated Grandpa Green, which was a 2012 Caldecott Honor book, and It's a Book, which has been translated into more than twenty-five languages. His other works include the national bestsellers Madam President and John, Paul, George & Ben, the Caldecott Honor winner The Stinky Cheese Man, and The True Story of the 3 Little Pigs, among many others. His books have been New York Times Best Illustrated Books on four occasions. Lane and his wife, book designer Molly Leach, live in rural Connecticut. *"A frolicking romp through the zany world of nonsense verse.... Visual, aural, and downright guffaw-inspiring puns and riddles abound in this wildly imaginative and cleverly illustrated debut collection. The inspired and inspiring sense of play knows no bounds." *"Those who claim to hate poetry will enjoy this riotous compilation.... Fans of Ogden Nash, Shel Silverstein, and Jack Prelutsky will rejoice in finding another member of their gang. Smith matches Harris's wit with his own zaniness.... A surefire winner for reading aloud or for snickering with under the covers." *"Hits a poetry trifecta: high energy, rhymes that can rival Cole Porter's, and a torrent of ideas...a worthy heir to Silverstein, Seuss, and even Ogden Nash." *"A magnificently wacky romp through verse... This moving, madcap anthem to language is sure to stand the test of time." *"There's not a dud in the bunch." "It's a veritable sundae of delights-layers of puns, word games, visual jokes-that I honestly would give to any kid ages short to tall." "I am a grown man and this book made me laugh out loud. When I was a kid, this was the kind of book that made me want to make comedy." —Jason Segel, actor, screenwriter, producer, and author of Nightmares! "This book, with its loony poems and seriously weird illustrations, is ridiculous, nonsensical, peculiar, outrageous, possibly deranged--and utterly, totally, absolutely delicious. Read it! Immediately!" "Chris Harris is a poet and everyone should know it! Love this book!" And it's hard to write poetry, particularly if it's supposed to rhyme or fit into a certain rhythm, and if you don't believe me, take a look at this." "I doubt that you'll ever read another book this clever, brilliant, or fun--but if you do, you'll say that that book is a Chris Harris-y one." "Hate to laugh? Love feeling blue? Are you quite dull? And dreary, too? Too bad, these rhymes are NOT FOR YOU." "Chris Harris is one of the funniest, sharpest, cleverest (not a word) writers I've ever known (and I'm not just saying that because we share a last name). This book made me laugh and laugh and laugh. I can't recommend it enough." "Funniest book of the year for kids? Gosh, there's a lot of competition out there but. . . . YES, YES, ALL RIGHT, YOU GOT ME! This is probably the funniest book of 2017 for kids. " "Inventive...whimsical...worth adding to your shelf." "Turns words into playthings and tickles readers' funny bones. If you thought poetry was boring, this book will change your mind."